Sending employees on assignment abroad can be an expensive endeavour, on average traditional expatriate assignments can cost a company approximately 2 to 2.5 times the employees annual salary each year. However, companies can structure their assignments in various ways to ensure they are more cost effective. One of the key considerations in structuring international assignments is the tax implications and benefits in host countries. In this article we look at international assignments and taxation from a French perspective, exploring the French income tax landscape in comparison with the rest of Europe first and then touching on the factors employers need to be mindful of when sending employees overseas. It remains a popular belief that French employees assigned to a foreign country will pay less income tax abroad than in France. 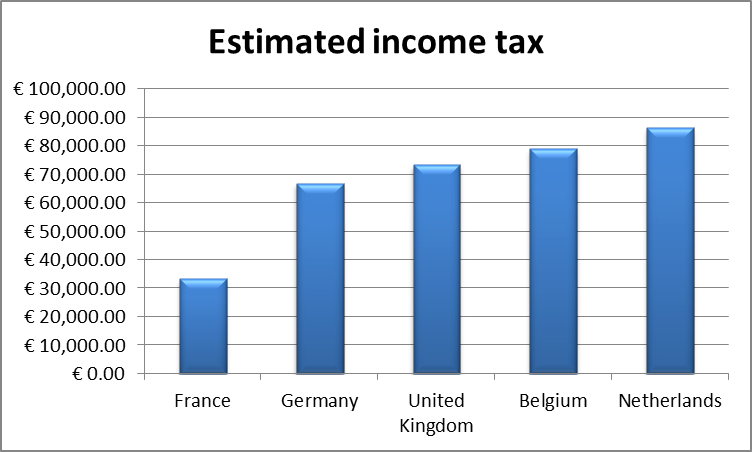 However, taking into account the French personal income tax regime, it is evident that the taxation of employment income in France may actually be more favourable than other foreign systems. For example, what would the income tax be in various host countries for a married couple with two children and a global taxable income of EUR 200,000? Although the social security contribution rates in France are generally higher than other countries, it is evident from the graph above that the employment income tax system in France is considerably more favourable, especially for employees with family there. This is mostly due to the way in which personal income tax is calculated whereby the family status and their income is taken into consideration (as mentioned below). Even though the taxable salary is capped, for a family with two children it significantly reduces the global tax burden. It is clearly important that the tax impacts of an international assignment not be neglected, and although some companies may consider this a private matter, employers who send employees abroad must at least, within the scope of their obligation to inform employees of changes to their conditions of employment, draw the employee’s attention to their tax situation once abroad. The employer’s implication may also include tax equalisation or a comparative study of the employee’s net income after social charges and tax during the assignment. Tax equalisation ensures an employee only pays an amount of theoretical tax, while on assignment, equivalent to what they would have paid should they have remained in the host country. On the other hand, the employer pays the actual amount of tax due in the host country. This practice, which is not governed by any specific regulation, must be clearly agreed between the employer and employee before work abroad commences. The reference salary used to calculate the “theoretical” personal income tax: should it be the pre-expatriation salary, or the base salary during the assignment, which generally takes into account a “promotion” linked to the assignment? The family status of the employee and other income: on which basis should personal income tax be calculated? Will non-professional income of the household be included (such as income from real estate)? Other compensation items such as variable compensation, equity based schemes, deferred compensation, profit sharing schemes, etc. : should they be taken into account? Although there is no clear guideline, generally only employment income of the employee will be taken into account for tax equalisation, along with the employee’s full family ratio so that the exclusion of the household’s other income would be partly compensated (the theoretical personal income tax being lower, and the net guaranteed income higher). Whether a taxable event occurs in the host country. If the host country applies the OECD principles in relation to the sharing of the right to tax the acquisition gain. How the acquisition gain is taxed. Specific attention must also be given to the means of “payment” of certain compensation items. Housing may generally be a rather easy way to optimize the tax and social security treatment of the tax benefit, particularly in countries where housing costs are extremely high. The tax impact of the provision of the flat/house by the employer (which would be the owner or the lessor) is in many countries far more limited than the one of a mere refund of the rent. In Japan and Hong Kong for example, where the housing costs are particularly high, the benefit in kind is taxable only up to 5% of the actual rent and to 10% of the taxable income respectively. Similar to the “inbound” expatriates’ regime implemented by France in 2005, recently loosened by the Macron Act (intragroup mobility within France used to trigger the loss of the tax regime, which is no longer the case), various countries allow talented workers from abroad to benefit from tax breaks. Subject to meeting certain conditions, employees can benefit from tax rebate on their taxable income in European countries which include Belgium (foreign executives’ regime), the Netherlands (30% ruling), the United Kingdom (remittance basis), Denmark, and more recently Italy (see overviews here). Some non-European countries also have similar types of schemes, such as Singapore and China. How can you optimise your international assignments? Utilising tax treatment of host countries during international assignments can greatly benefit employers and employees alike. However, the correct structuring of assignee packages and employment structures can be complicated and it is suggested that employers obtain the input from a professional tax advisor in order to ensure it is implemented in the correct way and understood by all parties.